Last week we were feeling the opposing forces of being exhausted from the physical aspects of walking the parking garages and the convention center, running to and from classes and lectures, and the excitement and joy from seeing the exquisite, innovative work of the quiltmakers and award winners, visiting with quilting friends, and discovering new products and techniques associated with quiltmaking. 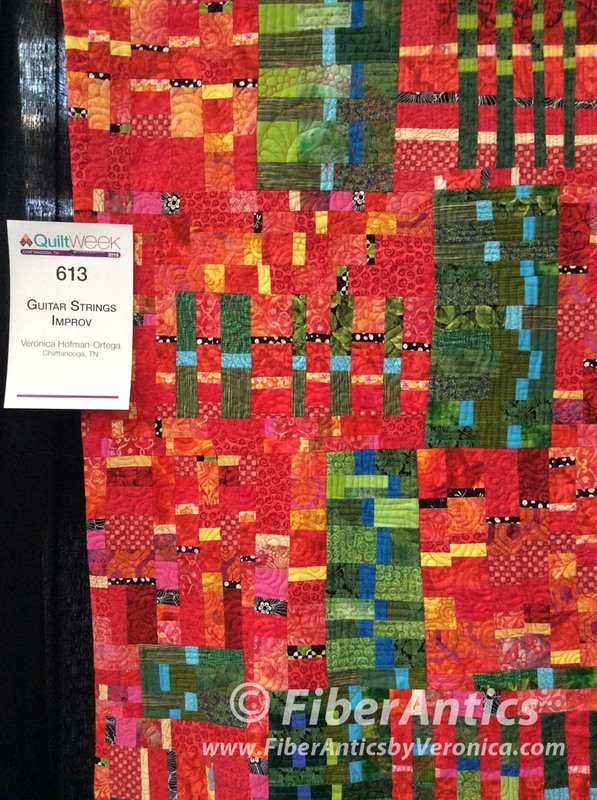 Yep, that's QuiltWeek and "QSA" [Quilt Show Afterglow]. Hopefully, the scale was tipped in favor of the excitement, and the learning for those that attended. In addition to volunteering every day during the show, I made time to take a string piecing class with Lynn Harris and attend some lectures for my personal growth as a quiltmaker. 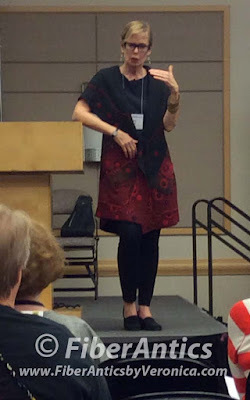 Yes, you can take on-line classes, and buy books (of which I have many! ), but taking a class in person offers so much more. Here are thoughts about taking on-site classes. With on-site classes, there is a live dialog between teacher and student—or teacher and multiple students—that doesn't happen elsewhere. You can post questions to on-line class platforms, but an immediate, real-time dialog and face-to-face discussion accompanied by the projects and quilt samples that are there in the classroom, is dynamic. As a class participant, you gain inspiration, insight and knowledge from all these impromptu conversations. 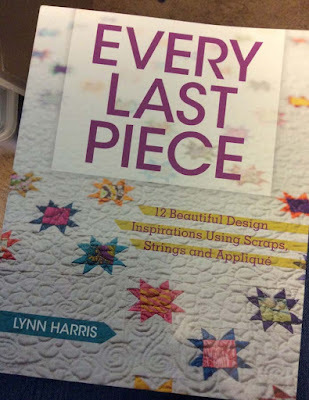 Lynn Harris discusses and show examples of string piecing. Some questions that come to light from a classroom of students or from a live audience cannot be anticipated. If you practice active listening in a class, you often learn from other students as well as from the instructor. In one of the lectures I attended, the instructor mentioned the Frixion pen. Four or five hands shot up with examples and experiences about this tool. [Read Jenny Lyons' research here and here]. Spending time with your friends in the class and working on the same project/technique offers a sense of community and camaraderie. It's a shared experience. We build memories when we take classes together. With both classes and lectures, you hear the stories first hand. Instructors share personal philosophies and the "back story" about certain pieces in addition to the information about construction or fabric choices. 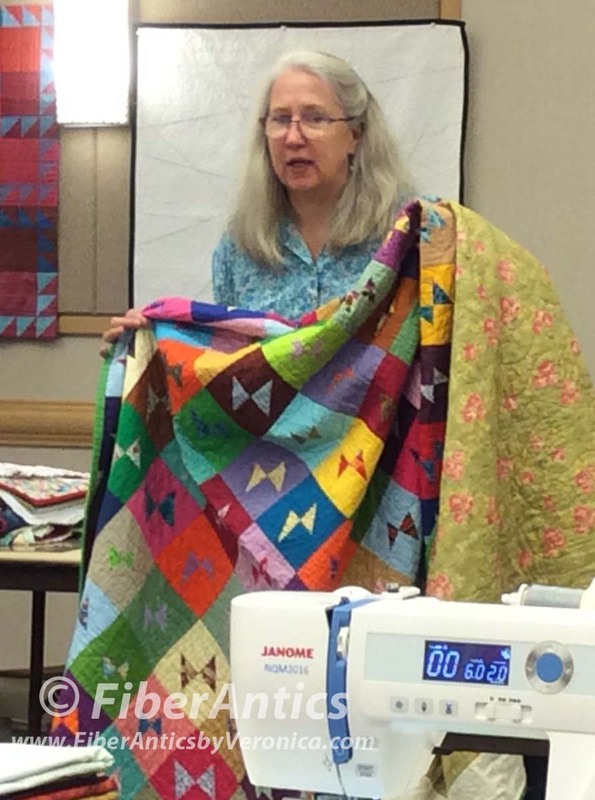 Meg Cox shared small quilts from her personal collection. 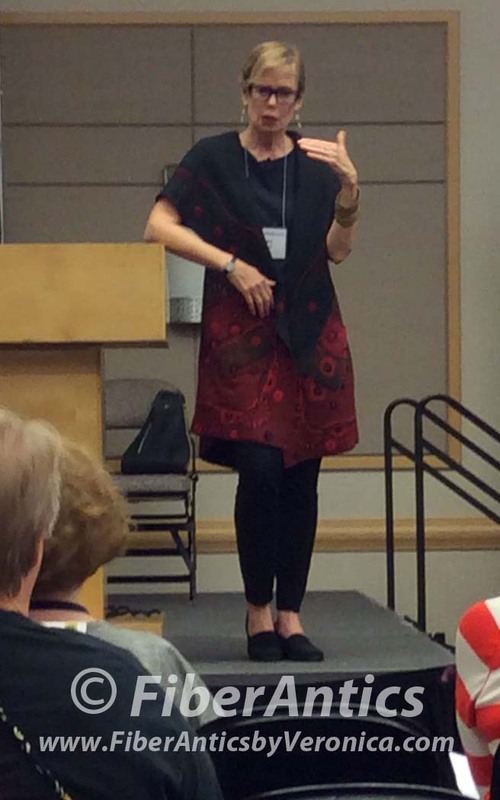 Paula Nadelstern's advice, "Don't be shy," was a good take-away from her lecture. Even when everyone in the classroom works on the same project or is learning the same technique, each one's interpretation or choice of color, fabric or thread is different. Walk around the room. See the other possibilities. Journey down other people's paths of discovery. You can't make every possible color or fabric combo for the project yourself (although you can certainly try). And there is something to be said about laughing... or crying... with a crowd. It's like being at the movie theater vs. watching the movie at home on your TV. It's a different kind of experience. With all these advantages, I encourage everyone to sign up for and take on-site classes—at YLQS or at regional and national quilt shows. 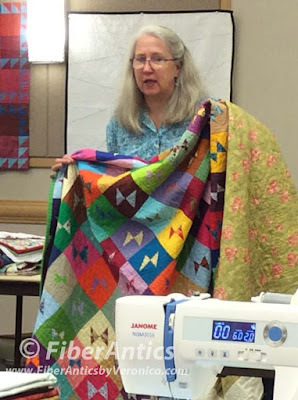 As a quilting instructor myself, I so much appreciate the students who attend my classes, ask questions and share their projects. I am also grateful for the shop owners who offer their spaces to let teachers share what excites them. After taking Lynn Harris's class, I also "bought the book." Do both, if you can. If you go to a quilt show and attend a class or lecture, please, PLEASE don't ask—or shame—the quilt show volunteers to break the rules, give you additional compensation, or be an accomplice to your stealing. If you paid admission to attend a lecture, you are given a handout (as authorized by the presenter and/or the show sponsor). One ticket = one handout. Often, the handout includes "notes" about what is presented in the lecture (not a script) so attendees don't have to write everything down as the presentation unfolds. This is a convenience for you, as an attendee. A handout is additional work/content/information that is given to an attendee in exchange for payment of the class/lecture. So, please don't ask the volunteers—who are specifically directed to check name badges (with no cross-outs), confirm receipts of payment, and insure the corresponding session number appears on the attendees name badge—to Give. You. 2 or 3. Extra. Handouts. These are not theirs to give. Volunteers are given explicit instructions about the job for which they volunteered. Please don't put them in a compromising position. You received your handout as part of the admission. Why do you need 2 or 3 more? The handouts are "notes" which would have less meaning for "another someone" who did not hear the talk. There is also a cost for preparing, printing and sometimes shipping them. And when the volunteer tries to explain to you the directions they were given, please don't retort with a sarcastic remark. They are doing their job and being good stewards of property that was entrusted to them. Thank you for your coorperation.